In October 1895, the twenty-nine year old H.G.Wells was in the first flush of his fame and success. The Time Machine, serialised the previous year, had appeared in book form over the summer, and was heading for the Christmas bestseller lists on the back of reviews that were already proclaiming its author a ‘man of genius’. Publishers and magazines were scrabbling over the rights to his future work, and outlines and sketches for The Island of Dr.Moreau and War of the Worlds were being briskly circulated on both sides of the Atlantic. But the most curious approach that Wells received that month was from a designer of electrical and optical instruments named Robert W. Paul, inviting him to his offices at 44 Hatton Gardens to discuss a patent that he was developing to bring the Time Machine to life before the eyes of the paying public. What Paul had in mind was not strictly a movie, as the projected motion picture was yet to be invented: the Lumière Brothers’ historic Cinématographe exhibition at the Café de Paris would not take place until December 28 of that year. Yet in other respects it was far more than a movie, a multimedia extravaganza involving magic lanterns, viewing carriages, wind machines, flicker-strips and futuristic stage sets that remains unrealised even today. Like the Lumières – and indeed many technicians across Europe and America – Paul had the projected moving image in his sights, but his route of approach towards it was unique, and Wells’ concept of the Time Machine uniquely suited as its subject matter. For Paul had realised that he was attempting to do precisely what Wells’ protagonist, the Time Traveller, had done: design a device for travel in the fourth dimension. Both the original serialisation and the novel of the Time Machine open with a Socratic dialogue led by the Time Traveller, arguing that time is the fourth dimension and that it is theoretically possible to travel in it just as we now travel in the other three. This preamble seems rather superfluous today, but it was speculative four-dimensional geometry that gave Wells the framing device and plot mechanics for his series of future visions, and in turn sold his readers on the assertion that the strange scenes that followed were not fantasies but predictions plausibly informed by cutting-edge science. The authority cited in the novel by the Time Traveller, the American astronomy professor Simon Newcomb’s lecture on the fourth dimension to the New York Mathematical Society in December 1893, had in fact been Wells’ own inspiration for a time-travelling device moving in ‘another dimension at right angles to the other three’. The notion of a fourth dimension of space had, in various guises, been in the popular sphere for a decade. 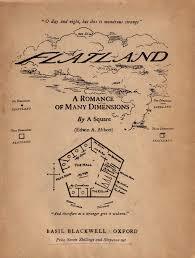 The London schoolmaster Edwin Abbott’s Flatland: A Novel of Many Dimensions (1884) had combined Alice-in-Wonderland nonsense and mathematical logic to lead its protagonist, and thereby its readers, to ‘the land of Four Dimensions’. The maverick mathematician, Theosophist and bigamist Charles Howard Hinton had proclaimed the dawn of the ‘four-dimensional era’ in a series of eccentric works including What is the Fourth Dimension? (1884) and A New Era of Thought (1888). Both Abbott and Hinton had popularised techniques for training, or tricking, the mind to think in four dimensions; Hinton had been perhaps the first to identify the fourth dimension with time, a nebulous but tantalising idea that was simultaneously moving Albert Einstein towards the notion of space-time curvature and the theory of relativity. Like Abbott, Hinton and indeed Wells, Robert Paul’s task also turned on tricking the mind into inhabiting the fourth dimension, but in his case as a physical illusion presented to a live audience. Like the other pre-cinematic pioneers, he had two established technologies at his disposal, which needed somehow to be merged to create this illusion. The first was the magic lantern, which had existed for centuries and had long been a staple of public entertainment, and was now edging towards the moving image with sophisticated patented refinements such as the Sciopticon and Stereopticon which offered lap dissolves, cascading rain and snow effects, motion loops and illusions of three-dimensional depth. Now, as of 1894, there was a second: Thomas Edison’s Kinetoscope, which offered hand-cranked flicker images to individual viewers, who peered into its convex glass eyepiece to experience what had rapidly become known as the ‘peep show’. The Kinetoscope gave a true illusion of motion in the way that magic lanterns never quite could, but it was a large, clunky and expensive box limited to a single viewer at a time. There were compelling incentives, both artistic and financial, to find a way to project its illusions, like those of the magic lantern, into a large public space for mass consumption by an awestruck public. Paul had already made some progress towards such a system, but to fund its further development he was also busy exploiting the current market for the peep-show. The business model for those who were attempting to pull off this trick was a peculiar one. Edison had patented the Kinetoscope in America but not internationally, which meant that Paul could extend the range of optical instruments he was already producing to include unauthorised Kinetoscopes at a price that undercut Edison’s imported machines. Edison had, however, copyrighted the films that he produced for his device: typically comedians mugging or sneezing, vaudeville turns and the ubiquitous exotic dancers and scantily-clad women that gave the Kinetoscope its other unofficial name of ‘what-the-butler-saw’. Thus engineers like Paul, to make their machines worth buying, tended also to become film producers in order to generate content that Edison did not control. But when he read The Time Machine, Paul recognised that this was material too rich and complex for the peep-show; it was, by the same token, the ideal subject matter to showcase his prototype projection system. The similiarities between Wells’ visualisation of time travel and the type of illusion that Paul was trying to achieve are striking, and probably more than coincidental. The Time Traveller’s machine cranks slowly up to speed, generating a flickering effect as it cycles ever more rapidly through day and night. As it picks up momentum, the flickers correspond to longer-scale natural cycles which echo some of the most familiar flicker-book, zoetrope and peep-shows scenes: trees clothe and unclothe themselves with the seasons, snow settles and thaws, the sun whirls round the horizon, the moon flashes from new to full and back again. On the Time Traveller’s return from the far future, the same scenes run in reverse, like a flicker-book started from the back: the cycles of day and night slow, and his landlady comes into vision scuttling rapidly around the room backwards. In 1924 Terry Ramsaye, author of the early film history A Million and One Nights (1926), wrote to Wells asking if these images had been inspired by pre-cinematic motion picture devices; Wells professed himself unable to remember, yet it seems likely that Robert Paul was not simply appropriating Wells’ literary inventions, but reclaiming his time-travel scenes for the medium in which they had, at least in part, originated. As recalled by Paul in 1934, his meeting with Wells was cordial, if not the start of the working partnership he had perhaps hoped for. He demonstrated the device he was working on to project moving images, which he had dubbed the Theatrograph, and in which Wells was ‘evidently interested’, although like most people at the time he ‘showed no knowledge of the working details’. 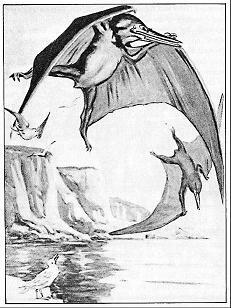 Wells was helpful in suggesting possible content for Paul’s new device, recommending H.N.Hutchinson’s Extinct Monsters (1892) as the best illustrated reference source for recreating the world of the dinosaurs. He was also happy to give Paul permission to adapt The Time Machine for his Theatrograph and, later that month, the patent office received an application for ‘A Novel Form of Exhibition or Entertainment’ designed to give its audience ‘the sensation of voyaging upon a machine through time’. Paul’s patent sets out, in outline rather than full technical detail, how this effect is to be achieved. The spectators are to step onto a platform, its sides enclosed with railings, facing their direction of travel into the future. At this point the future is dark. The platform, suspended from cranks or mounted on hydraulics, begins to rock and judder, and fans blowing air assist in creating the illusion of forward motion into blackness. The platform may, in fact, move a short distance along rails. Centuries elapse, in flickering dim light, until an announcement that the spectators are closing in on a scene from the future. The scene, thrown upon a screen, is initially visible in the far distance, growing larger by means of mounting the screen on tracks that carry it gradually towards the spectators’ platform. As the screen becomes larger and clearer, the scene springs to life with an elaborate combination of projection techniques. Magic lantern slides form a panoramic backdrop; further slides move across these, projecting superimposed details such as drifting clouds or balloons. Still more changeable or perforated slides overlay foreground textures, such as sun or moonlight, rain or snow. And set within this scene are moving people or creatures, ‘successive instantaneous photographs, after the manner of the kinetoscope’: motion loops captured against a neutral stage background and imposed to blend into the multiple images around them. At this point lights would fade up in the area aound the screen, revealing a stage set extending the panoramic scene into the foreground. The spectators would be invited to dismount from their platform, which has trundled forwards under cover of darkness, to explore the future scene in three dimensions. Returning to their platform, they would move forwards once more to encounter another future scenario. After reaching their final destination in the far future, they would voyage backwards in time, the illusion of speed increasing as they hurtled towards the present. In a final twist, they would accidentally reverse too far, and find themselves in a scene from the distant past: it was for this parting shot, perhaps, that Wells had recommended Hutchinson’s Extinct Monsters. As they returned to the present, the venue in which they had arrived would appear dimly upon a screen, growing larger and larger until they were invited to step out into its real-life equivalent. At a time when most of his rivals had considered filming little but crowd shots and slapstick pratfalls, Paul’s patent was as original and ambitious in its way as the novel it adapted; but its ambition was to count against it. He struggled to find financial backers for an expensive elaboration of a medium that was widely perceived as a fad; Sir Augustus Harris, manager of the Drury Lane Theatre, informed him confidently that the motion picture would be ‘dead’ before 1896 was out. The Kinetoscope might have been all the rage, but it was also a gimmick with limited applications that was not expected to keep the public entertained for long. Paul had found even Wells, who had some technical understanding of optical instruments such as microscopes and a unique grasp of the public’s appetite for futuristic wonders, hard to enthuse about the possibilities of the new medium. In the meantime, there were plenty of other openings for London’s best-known optical engineer. Paul’s core business of making specialist implements such as microscopes, laryngoscopes and ophthalmoscopes was well established; now, too, copies of Edison’s Kinetoscope were greatly in demand, and he had more orders for them than he could fill. 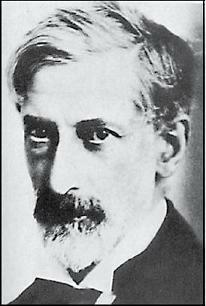 Yet he persisted with his design for a ‘projecting kinetoscope’ and his Theatrograph finally gave a successful public performance at Finsbury Technical College on 20 February 1896, the very same night that the Lumière Brothers’ Cinématographe made its London debut at the Egyptian Hall in Piccadilly. The Lumières may have scooped the grand prize and the posthumous fame, but their success was also Robert Paul’s gain. 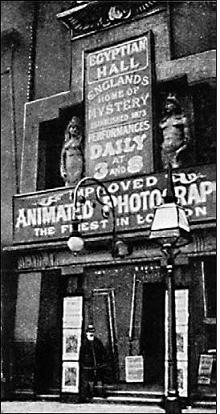 The Egyptian Hall, the premier venue for London’s stage magicians, had long hosted state-of-the art magic lantern shows, optical illusions and shadowplays, and its performers were the first to recognise the potential that the Cinématographe held for them. But the Lumières’ price was extortionate: the Cinématographe could not be bought, only rented (with licensed service technicians) for the staggering sum of £100 a week. John Nevil Maskelyne, the Egyptian Hall’s director, shared the prevailing view that moving pictures were a ‘nine days’ wonder’ and refused to contemplate such prices, but one of his star performers, the illusionist and shadowgraphist David Devant, was not to be denied. As soon as he heard of Robert Paul’s Theatrograph demonstration, Devant tracked the inventor down and offered him £100 for the first of his new machines off the production line. Paul agreed, and within weeks magicians and variety show producers were demanding the new machines faster than he could assemble them. Paul was also now filming Devant’s tricks – rabbits from hats, origami displays and hand shadow illusions – on the roof of the Egyptian Hall during the day for projection during the evening show. By this time George Méliès, a magician and illusionist who had been watching the Lumières’ work closely from the outset, had begun to make dazzlingly imaginative use of cinematic tricks such as stop motion, jump cuts and superimposition, not only bringing classic magic tricks to the screen but supplanting them with illusions that had previously been impossible. By 1897, once Méliès had acquired a British distributor, Paul was able to keep pace with him by cannibalising some of the ideas he had developed for The Time Machine into short films: horses running backwards, shooting stars appearing through bedroom windows or octopi dancing at the portholes of submarines. By 1905 his company, Animatograph Works Ltd, was producing an average of fifty films a year, more than any other outfit in Britain. But the Time Machine itself was never to materialise. Paul’s patent had, with hindsight, been a peculiar combination of pre-cinematic ideas that would become redundant and post-cinematic ones that would remain beyond the horizon. Although he had effectively invented several defining elements of film grammar – the zoom, the track, the fade in and out, multiplane camerawork and perhaps even the very idea of the screenplay – he had arrived too early to anticipate how many of these tricks of motion would soon be accomplished in the camera and on the screen, rather than by moving the spectators around on clunky and costly apparatus. Yet in other respects these elaborate mechanics look forward to forms that we have only recently begun to explore, and which may yet be in their infancy: the ‘ride technology’ of the modern theme park, the ‘expanded cinema’ of installation art, the immersive technologies of virtual reality. These contemporary resonances remind us that, even before cinema had been fully born, its pioneers shared our modern urge to break through the barrier of the screen, to explore around, behind and inside it, and to hijack the sensorium of the viewer entirely. Though Robert Paul’s Time Machine never whisked any spectators into the future, his patent still holds the power to set future days and nights flickering before our eyes, and to remind us that our adventures in the fourth dimension may have only just begun. My invention consists of a novel form of exhibition whereby the spectators have presented to their view scenes which are supposed to occur in the future or past, while they are given the sensation of voyaging on a machine through time, and means for presenting these scenes simultaneously and in conjunction with the production of the sensations by the mechanism described below, or its equivalent. The mechanism I employ consists of a platform, or platforms, each of which contain a suitable number of spectators and which may be enclosed at the sides after the spectators have taken their places, leaving a convenient opening towards which the latter face, and which is directed towards a screen upon which the views are presented. In order to create the impression of travelling, each platform may be suspended from cranks in shafts above the platform, which may be driven by an engine or other convenient source of power. These cranks may be so placed as to impart to the platform a gentle rocking motion, and may also be employed to cause the platform to travel bodily forward through a short space, when desired, or I may substitute for this portion of the mechanism similar shafts below the platforms, provided with cranks or cams, or worms keyed eccentrically on the shaft, or wheels gearing in racks attached to the underside of the platform or otherwise. Simultaneously with the forward propulsion of the platform, I may arrange a current of air to be blown over it, either by fans attached to the sides of the platform, and intended to represent to the spectators the means of propulsion, or by a separate blower driven from the engine and arranged to throw a regulated blast over each of the platforms. After the starting of the mechanism, and a suitable period having elapsed, representing, say, a certain number of centuries, during which the platforms may be in darkness, or in alternations of darkness and dim light, the mechanism may be slowed and a pause made at a given epoch, on which the scene upon the screen will come gradually into the view of the spectators, increasing in size and distinctness from a small vista, until the figures etc. may appear lifelike if desired. (1) A hypothetical landscape, containing also the representations of the inanimate objects in the scene. (2) A slide, or slides, which may be traversed horizontically or vertically and contain representations of objects such as a navigable balloon etc. which is required to traverse the scene. (3) Slides or films, representing in successive instantaneous photographs, after the manner of the kinetoscope, the living persons or creatures in their natural motions. The films of slides are prepared with the aid of the kinetoscope or special camera, from made up characters performing on a stage, with or without a suitable background blending with the main landscape. The mechanism may be similar to that used in the kinetoscope, but I prefer to arrange the film to travel intermittently instead of continuously and to cut off the light only during the rapid displacement of the film as one picture succeeds another, as by this means less light is wasted than in the case where the light is cut off for the greater proportion of the time, as in the ordinary kinetoscope mechanism. (4) Changeable coloured, darkened or perforated slides may be used to produce the effect on the scene of sunlight, darkness, moonlight, rain etc. In order to enable the scenes to be gradually enlarged to a definite amount, I may mount these lanterns on suitable carriages or trollies, upon rails provided with stops or marks, so as to approach to or recede from the screen a definite distance, and to enable a dissolving effect to be obtained, the lantern may be fitted with the usual mechanism. In order to increase the realistic effect I may arrange that after a certain number of scenes from a hypothetical future have been presented to the spectators, they may be allowed to step from the platforms, and be conducted through grounds or buildings arranged to represent exactly one of the epochs through which the spectator is supposed to be travelling.